I’ll Be At Music Education Week 2010 Tomorrow Afternoon. We’ll, I finally made it to D.C. for a meeting about the future of music education and music technology with MENC/NAME tomorrow evening and to catch the tail end of the Monday events. 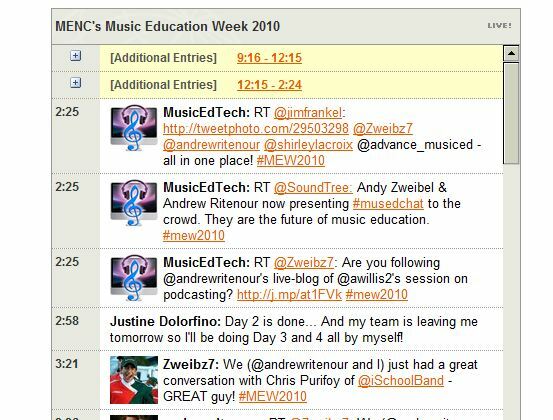 There have been some exciting things going on this year with the Music Education Week, not only for attendees, but also for people “tuned” into the MENC mediastream through Twitter. 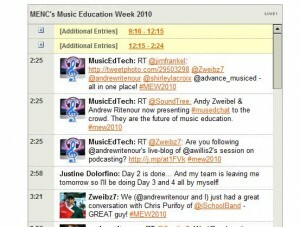 You can see some awesome tweets about what’s happening at the Music Education Week 2010 by checking out this year’s hashtag: #mew2010. Click here for a direct link to Twitter’s stream of the tweets. This year there also was an INCREDICBLE Live Blog of what was happening (is happening) at MEW2010 over at MusicEdMajor.Net. and made possible by a gracious grant from Soundtree. This year, Andrew Ritenour, Justine Dolorfino, Brigid Moran and Andy Zweibel attended the conference, and live-blogged their experiences. CHECK THE LIVE BLOG OUT and the Upcoming LIVE Blog Archives from the Music Education Week! Well, that’s it for now! I’ll be back at it here at MusTech.Net mid-week! Enjoy the crazy hot weather we’ve all been having and try to stay cool!